A Wine Pull can add a fun element to your event and bring in extra money for your organization. Many of you may have organized a wine pull for your event, or have participated by buying a chance to win a valuable bottle of wine at a charity fundraiser. How can you organize this part of the event to bring in the most money? A wine pull is a “drawing” for wine at a fundraising event. For a 300-500 person event, you can offer up to 150 bottles of wine. Each bottle should be wrapped or placed in a sealed wine bag, so the label cannot be seen. You can “dress” the bottles to go with the theme of the event. This can be as easy as using tissue paper in the colors of the event to wrap the bottles with a pretty ribbon. 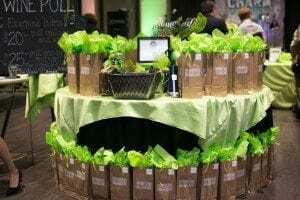 One event we attended wrapped the bottles in black and white tissue to resemble tuxedos complete with a bow tie at the neck! The link below shows how to create this look with felt too. http://www.bhg.com/halloween/parties/bottle-tuxedo/. A religious event showcased their bottles in priest robes made of inexpensive fabric, complete with white collars! Another event wrapped their bottles in newspaper, shredded the top of the paper to look festive and tied pink, red and white ribbons around the neck to indicate the color of the wine. Each person purchases a bottle for $25.00 and then pulls off the wrapping to see what kind of bottle they won. A simpler route (but not as festive, I think) is to simply number the bottles of wine with a tag around the neck. A person buys a numbered cork from a basket or draws a number from a bowl and wins the corresponding bottle of wine. The bottles should all be valued at least the amount of the cost of each drawing. Some of the bottles can be valued more, so they have the chance to win a $50 bottle or a $100 bottle of wine. Another great idea is to attach a coin under one or two lucky bottles of wine. If you get that bottle, you win $100 of Northpark Gold or cash. Place the Wine Pull Table Display near check in so guests have to pass by as they enter the event. Most guests will not want to carry their bottle around, so label the bottle with their bid number or name, and offer to place their bottle at the checkout table where they can retrieve it at the end of the night. Typically the wine pull will sell out quickly. If all of the bottles are not sold by the time the live auction begins, we like to offer the remainder of the bottles as a Live Auction package. This usually brings in as much or more than the bottles are worth, since live bidding for wine is so popular! Share your ideas! Click here, Like us on Facebook and post on our wall to share how you made a fundraising event successful or saw a great idea at an event you recently attended! We will choose one idea a month to showcase on our Blog and if yours is chosen, we will send you a gift card as a thank you! In our next newsletter: How Do We Get the Wine Donated for the Wine Pull?